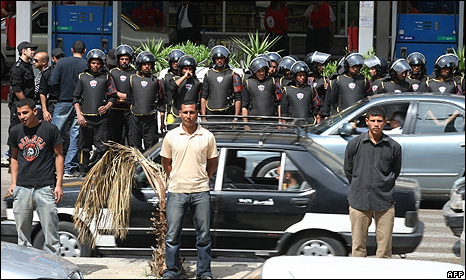 Police in Egypt have been deployed in large numbers to prevent a national strike by pro-democracy activists. Police had orders to arrest anyone taking part, and a number of activists have been held in recent days. Protests appear to have been small, but about 100 MPs, out of 454, walked out of parliament as part of the protest. The organisers of Monday's action had urged people to wear black and called for protests including sit-ins at places of work or study. The call to protest was circulated through SMS messages and social networking sites. The campaigners are pressing the government to raise the national minimum wage and are calling for a new constitution to be drafted. Activists were hoping it would build on a protest demanding economic and political reform they held for the first time last year. Three people died in the protests in April 2008 and hundreds were arrested. Egypt is run under a emergency law that has been in place since the assassination of President Anwar Sadat in 1981. The Muslim Brotherhood, believed to be the biggest opposition organisation in Egypt despite its being outlawed, has also backed the protest. On Monday hundreds of riot police were stationed in city-centre squares and around universities to prevent demonstrators from gathering. About 100 protesters gathered at the journalists' association headquarters in Cairo and chanted anti-government slogans. Hundreds of students also demonstrated on university campuses in Cairo and the southern city of Assiut. Ayman Nour , the leader of the opposition Ghad (Tomorrow) Party who has recently been released from jail, told the BBC Arabic Service that it was premature to judge the strike and that events were being organised throughout the day, across the country. He said that change in Egypt was necessary to break the political stagnation in the country: "[Change] is desperately needed in Egypt after more than 30 years of one-person rule. Egypt deserves much better than that."